I can just about officially say it’s flip flop weather, which makes this girl happy. We already visited our neighborhood pool and although I watched from the sidelines while my youngest swam, I did wear my newest pair of flip flops. My husband looked down at my feet and said “I have a feeling those are going to become your favorites.” He’s right. Who am I wearing you ask? Bethany by Cobian. 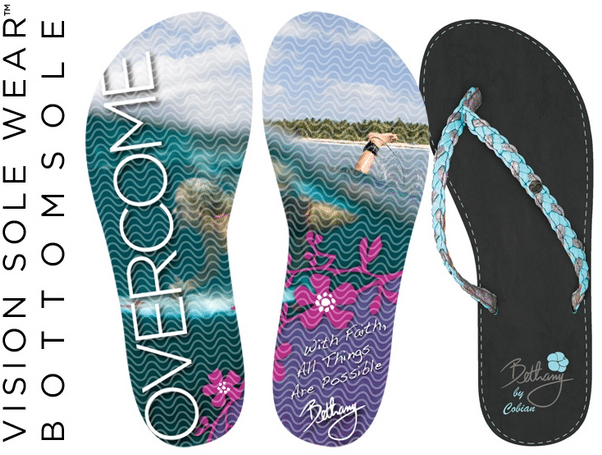 Or more specifically, Bethany Hamilton flip flops! Bethany is famous for losing her arm in a shark attack, fighting against all odds and becoming a professional surfer. Her story is inspiring to say the least and now she has another accomplishment to add to that list – a sandal designer! Amazing. Bethany launched her sandals at Flip Flop Shops nationwide at the beginning of April. She had a very cool contest, which just ended and she’ll be choosing the winner on May 16th. For my local Austin, TX friends, we do have a Flip Flop Shop here. Bethany’s Flip Flops are available for purchase, and with each purchase a donation is given to the Friends of Bethany Hamilton organization. “I am asked a lot where I find my inspiration, and these sandals were inspired by – and created for – my fans; for anyone motivated to lead a happy, healthy and charitable lifestyle,” said Bethany Hamilton, Cobian Ambassador. I can honestly say I love these sandals! They have a Synthetic leather squishy EVA top-sole with anatomical arch support, a synthetic leather braided strap with a pin and a clear bottom featuring an image of Bethany and an inspirational message. Mine say ‘Overcome’. I love that. These sandals were so much fun to style and I can wear them with so many things this summer. From jeans and shorts, to my bathing suit at the beach or a casual dress. Would you like to win a pair of your own? Great! Enter via the Rafflecopter form below. Please visit a Flip Flop Shops near you, as well as Bethany’s website and support her by purchasing a pair (or two, three) of these great sandals. Thank you! Disclosure: MomFabulous received samples to facilitate this post. No other compensation was received. I’ve got my flipflops on right now. I’ve already busted them out and won’t put them back until the 1st snow. It’s even flip flop weather in Alaska! I am ready for summer! Our spring has been very cold, so I am totally ready for flip flop weather to arrive! Just got a cheap pair to start off the season! Can never have too many. I am always ready for flip flop weather. I hate confining shoes. Yes, I was born ready for flip flop weather! Flip flop weather is year round here in SoCal! I love Bethany’s designs because they have the arch support, which I really need. Plus the colors are awesome! I’m definitely ready for summer. I’ve a ready started wearing my flip flops. Yes, I’m ready for warmer weather – but I don’t like it hot! Yes!! I like warm weather…70’s. Anything above that is TOOOO MUCH! I guess I have to be. lol I wear flip flops all year long. The only time I don’t is when there is snow on the ground. Thank you! I am absolutely ready for summer and flip flop weather! i live in california. i am always ready for summer. it is summer most of the year! Yes, I am very ready for summer and flip flops :). I am ready for warm weather, skirts, and sandals. I am ready for summer and flip flop weather. Bring on the sunshine! Yep! I’ve already got my first pedi of the summer! I am very ready to wear flip flops! I am officially ready. Sign me up. I sure am !!! toes are pretty and ready. It has been a long, crazy winter in Michigan so I am very, very ready! Being here in Upstate NY….you better believe I am ready for flip flops and summer !! Yes!!! It has been a LONG winter! I cant wait until summer and flip flop weather! I am definitely ready for summer and flip flop weather! Yes, I love it! Bring on the bbqs!